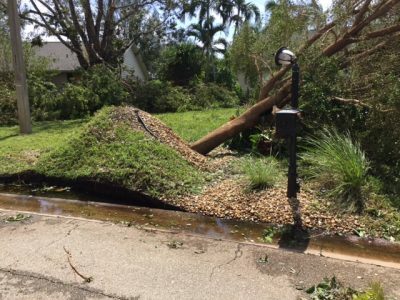 It’s been 2 weeks since hurricane Irma hit Florida and things are starting to get back to ‘normal’ around here. 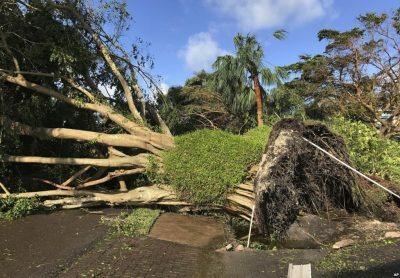 Everyone has their own hurricane story to share, so I thought I’d share ours. Growing up in Massachusetts I went through many blizzards, nor’ easters and even a few hurricanes, Gloria and Andrew. Both were Category 1 or 2 I think, at least where I was living at the time. Nothing like Irma. The fear of the unknown was frightening for us. we have lived in Naples for 8 years now and have been through numerous hurricane ‘threats’. Sandy was one that was supposed to hit us and then veered off and went up the east coast instead, devastating New York and New Jersey. And there were others too. It is always scary and you have to keep a close eye on them. So when Irma started getting close and was such a huge storm we were glued to the TV. We repeatedly heard the words, Cone of Concern, Spaghetti Models, Eye Wall, Category 5, Wind Speeds, National Hurricane Center Updates, Storm Surge, and a few more I can’t remember. We were tracking every minute of this thing and watched as sadly, some Caribbean islands got crushed. People started leaving town Tuesday and Wednesday before the storm. School was cancelled Thursday and Friday so that families could prepare. My husband was scheduled to fly to Boston Thursday night and return early Friday morning. I thought, ok, fine, we’ll just try to jump on his flight too and spend some time in our old home town. But, nope! ALL flights were booked up! And what about our 2 cats (we weren’t about to leave them behind)? And my mom too? I started looking at flights out of Tampa and Orlando, and there wasn’t one to be found. Then the news was saying to head inland so we started looking at hotels in Ocala and again there was NOT ONE to be found. 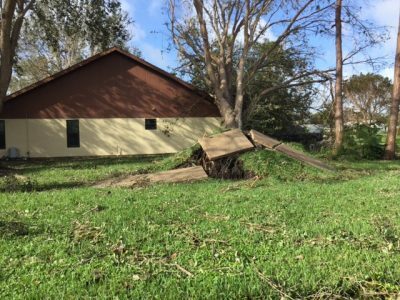 (And as it turned out Ocala got hit by the storm too). We gave up looking for a while, thinking, lets just wait. But, boy, it was a hard waiting game. Some of those Spaghetti Models had the storm going in the other direction, more toward Miami, and then some were even way off shore. But the Cone of Concern basically spanned the entire state of Florida. No where seemed safe. Miami Beach quickly ordered a mandatory evacuation, as did the Florida Keys. Friends from all over were texting and calling. Many were saying, “will you evacuate”? “Why won’t you just evacuate”? Well, it’s not that easy. Like I said above, flights and hotels were sold out. Many friends headed to Atlanta or Orlando to hotels but were uncertain if the storm would hit those areas too! The gas shortage and traffic were horrendous. 6 hour trips were taking 16. The thought of just getting in our car and heading somewhere, but not sure where, and maybe running out of gas in the process was very scary. Also the nightmare of having to do that all over again when returning was something to think about. The storm started shifting towards Naples. 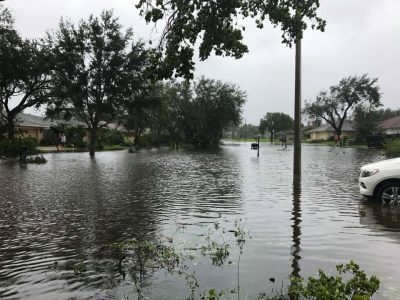 Governor Scott, who I have to say was tremendous through all this, started ordering mandatory evacuations in parts of Naples. Especially homes along the coast. My husband began calling some of our contractors and/or friends we know that are contractor’s asking them, “do you think our house will be safe”? 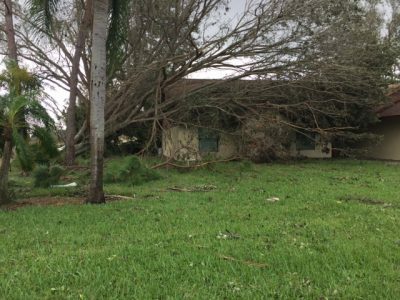 We have a brand new roof, hurricane impact windows, concrete block construction, We are up on ALL the latest and greatest hurricane codes that Florida has. They all agreed that we should be okay in this house. We made the decision to stay, although we kept waffling back and forth with ‘should we stay’, ‘are we making a mistake by not leaving’. It was extremely stressful and we lost sleep over it. We were both nervous, me especially. I lost 4 pounds in 3 days because I couldn’t eat, and my husband lost 5. On top of all the high winds that were inevitably coming I was worried about the potential Storm Surge that they kept talking about. We were NOT in a mandatory evacuation zone. 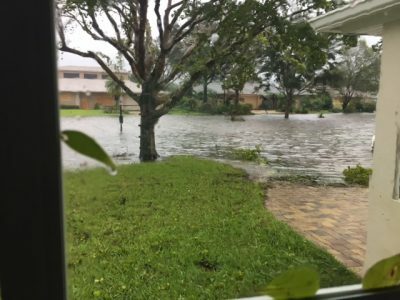 We are approximatley 4 miles from the beach, maybe a bit less, but they were saying that ‘worst case scenario’, our neighborhood could potentially get 1-3 ft of storm surge water on top of any rain from the storm. This was freaking me out. We do have a second floor, I thought, so at least we could escape the water, should it come, by going upstairs. But it’s so easy to think of all the potential worst case scenarios. Yes we can head upstairs if water starts coming into the house, but what if we have no roof? It’s maddening! Anyway, we made the decision to stay and many of our neighbors planned to stay too. Everyone began helping each other out. We invited our neighbors, Bob and Kelly, and their 2 kids, Brady and Elexa, who live across the street to ride out the storm with us. My mom was here too. It felt good to know people would be here with us. Power in numbers, right? It also felt good to have many friends/neighbors still in town that were just a text away. We stocked up on water, ice (which were quickly selling out all over town), non perishable food, batteries, flashlights (and we have tons of them!! ), wine (can’t forget the wine!!!) and we even scored a generator and gas at the last minute thanks to a friend who did lots of calling around town. And thank goodness for that generator. We even prepared several ‘safe zones’ in our house in case we needed them. We woke up from a pretty much sleepless night to already strong winds. We were prepared. Nervous as hell, but prepared. No turning back now. 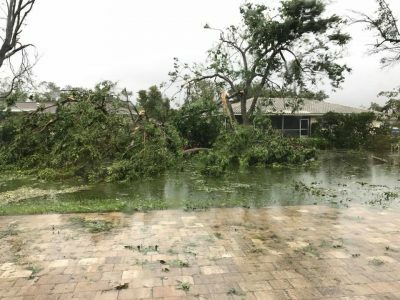 We were glued to the local news channel and can’t believe we didn’t lose our power or our satellite tv until the ‘eye wall’ went right over our house. We have DIRECTV and are constantly losing the signal during small rain storms. It did flicker on and off a few times, as did our power, but came right back on. It was truly amazing. I was also in contact with many friends throughout the storm who lost power WAY before we did. The winds continued to get worse as the day went on. It was AMAZING how quiet it was inside this house. A cousin of mine, who lived in Florida when Hurricane Wilma hit, told me to make sure the kids had headphones on because it would sound like a freight train going over our house. Thankfully it didn’t, and the kids were happy and were having a good old time watching cartoons and playing all day. Our neighbors 2 year old was even able to take a pretty long nap in our guest bedroom! We were able to watch the storm from our windows. They were rock solid. No storm shutters needed. We watched on the news as the Keys got hammered, and then it weakened a bit to a Category 3 when it hit Marco Island. Then it was our turn. The local weatherman was saying directly into the camera, “Naples, the eye wall is coming your way now. This may be one of the scariest things you will ever witness. Please, get in your safe zone now. 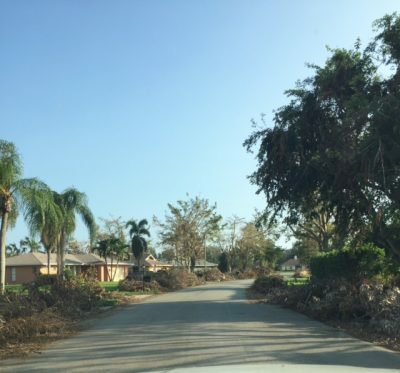 The winds are going to be very strong and trees will get knocked down, houses may be destroyed….etc. etc. etc….” Talk about scary! Then we finally lost power. 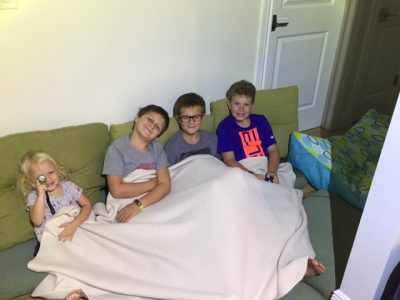 We got the kids into the safe zone (a downstairs hallway) but honestly it wasn’t necessary and after sitting there for a while we felt it was safe enough for them to walk around the house. The house wasn’t going anywhere and it was still so quiet considering there were 140 mile per hour winds blowing right outside. We continued to watch the storm from the front and back windows and it was absolutely amazing and terrifying watching the force and rage of Mother Nature. Our neighbors huge tree that borders our front yard, was dangerously swaying and all it limbs were falling down. Thankfully none of them hit our house. The tree in our front yard lost most of its limbs too but thankfully stayed standing. The Eye Wall lasted well over an hour. It felt like it would never end, and then it finally did. It was time for the eye of the storm. My husband, and our neighbor Bob, walked outside to take videos. We were amazed how calm it got. Our street was completely flooded and the water came half way up our driveway. Our next door neighbors tree had completely uprooted taking the sidewalk with it. 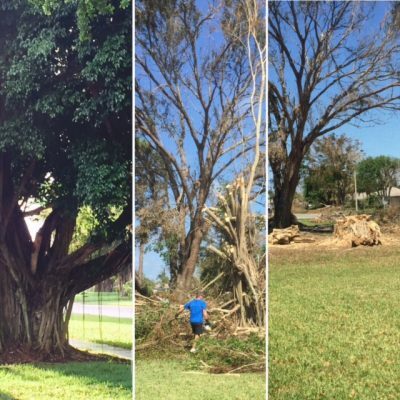 The other tree, the one we were worried about, lost most of its limbs (video below). We lost most of our soffits from the under part of our roof. I actually watched as one flew right off. Scary! View of our street, completely flooded. You can see my car in the top right corner. Our driveway and street flooded. Bob waded across the street to check on his house, and their cat. The water came up well over his knees. Thankfully all was ok inside. Their backyard was another story. Most of the trees were down and their 2 year olds little playhouse that Bob worked so hard on, and was featured on this blog, was demolished. The second half of the eye wall was not as bad as the first and by now it was dark and we couldn’t really see what was going on so we started drinking wine and cranking up music. Relief! We made it. The winds and rain continued all night (and were much louder upstairs), although not as strong, obviously, but I kept worrying about the storm surge. Would it come during the night? We were sleeping upstairs but our friends were downstairs. Would they get flooded? Needless to say I didn’t sleep much again. We had no wifi and no tv so weren’t sure what was going on. Our radio wasn’t coming in well. I was amazed the next morning that the water had subsided on our street. No more flooding (at least in our part of the neighborhood, the front part was still flooded for a few days) and NO STORM SURGE. Amazing. However, walking around the neighborhood the next day was devastating. Trees were uprooted everywhere! The water in our lake was up to the pier. The neighborhood playground and pool were a mess. 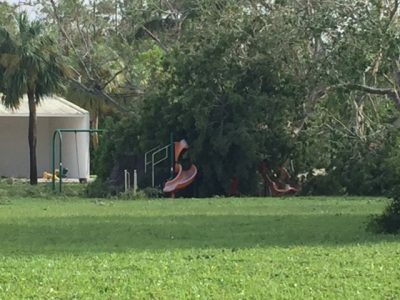 Trees had fallen on both the playground and the swing set. 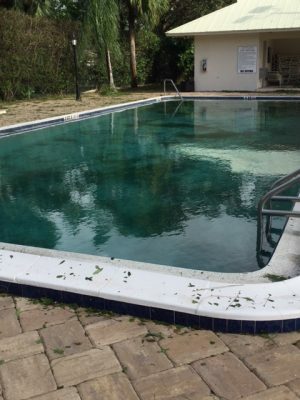 The community pool was filled with leaves and debris. Peoples pool cages were crumbled or screens were ripped out. Everything was a mess. We discovered our next door neighbors tree that completely uprooted fell right on their house! We found out later that there was no damage inside, but how scary! We were amazed that we had minimal damage to our house. Our pool cage stood standing and our pool wasn’t even really dirty. Besides some missing soffits, lot of tree limbs down in our yard, lots of leaves and debris and some flooding in our backyard, we were just fine. We feel SO LUCKY! Our neighborhood lake. 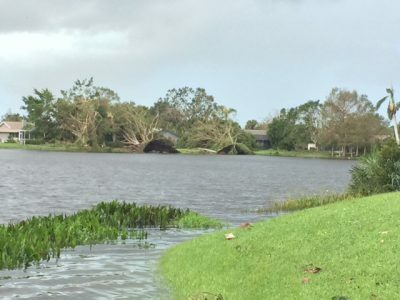 See the trees across the lake completely uprooted? My next door neighbors tree uprooted taking the sidewalk with it. Front view of the tree on their house. Power lines down at the front of our hood. Our community pool. Filled with debris. Our community playground. A tree fell right on top of it. 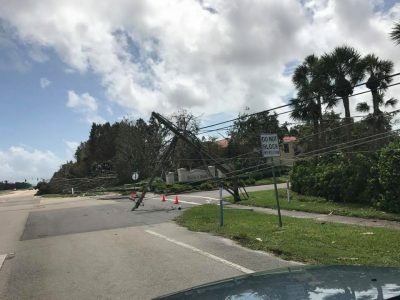 Most of Collier County was without power. Wifi was spotty. No power meant no cable televison to watch the news and to see all the devastation, although all we had to do was look around our own neighborhood to see it. A 9pm curfew was put in place. I drove my mother to her condo the next day and all was fine there, thankfully. However, there were trees down everywhere in her community. We were so thankful for our generator to keep our fridges going and for a fan and other small appliances (like the all important coffee maker!). We ran it in 4 hours increments then turned it off at night. Gas was scarce that first week so we were trying to conserve what we had, and running a generator all day takes a lot of gas. My husband had to wait in line at the gas station for over an hour just to get 10 gallons, which was the max you were allowed to buy. The line was insane though, going for probably a mile down the rode. It got HOT in our house. Opening windows didn’t really help as the air outside was no relief. Sleeping was hard and sweaty. We don’t get fall weather temperatures in Naples. Not yet anyway. It is still 92 degrees here and not much cooler at night. And very humid. AC is your best friend. Thankfully our pool wasn’t too dirty, so the kids were in it all week. I am not sure how safe the water was for swimming, but we were desperate to escape from the heat. We started cleaning up tree limbs and tons of leaves right away. There are just piles and piles of debris that line every street. They are working on taking it away but it hasn’t happened yet. Progression of our neighbors tree. Now it is just a stump. There was a boil water notice and a sewage issue as the lift stations lost power too. Sewage was backing up and seeping out of the manholes in many neighborhoods, including ours. Gross! We were told not to flush, take very short showers or none at all, not to use our washers, or dishwashers which we couldn’t do anyway since we had no power. But even after power was restored we were asked not to use them. I have to say our kids did really well through all this. We kept them busy doing puzzles, reading, playing with friends, swimming. They didn’t really complain. We had friends who’s power was restored rather early, and we were invited to stay there. After no power for 5 days we quickly said yes, and then, OURS CAME BACK ON. There was a collective Wahoo in our neighborhood and then just as quickly as it came on, it went off again. What? Noooooooo. But then a few hours later it came back on again for good. Many people had to wait a lot longer than 5 days though, including my mother who waited 9 days, and some STILL don’t have power. Many homes and trailers were completely destroyed. Just flattened. Many homes in other towns were completely flooded. It is devastating and so sad. People have lost everything. The below pictures are from the internet and are just a very small example of how things look for lots of people. 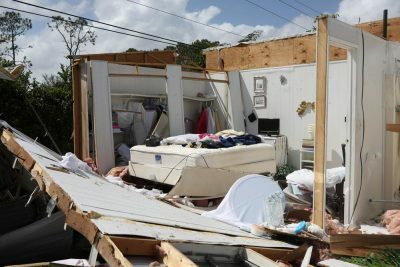 A destroyed mobile home is seen Sept. 11 after the passing of Hurricane Irma in Naples, Fla. (CNS photo/Stephen Yang, Reuters) See HURRICANE-IRMA-CARIBBEAN-AFTERMATH Sept. 11, 2017. There has been such an outpouring of support here. Power companies sent trucks from all over the country to help out. The Red Cross, FEMA, the National Guard and many other organizations are here. These fine people are sleeping in ‘tent cities’ on cots and working 12+ hour shifts. We can’t thank them enough for all they’ve done. People are organizing donation drives to help the people who need it most. Our church is taking donations so the kids and I brought a car load of stuff the other day. I plan to do more and yet it still won’t seem like enough. 2 weeks have gone by and most power has been restored now. Most businesses are back open. Tree debris cleanup continues and there is a constant buzz of chainsaws in the air. The kids finally went back to school today. All 54 collier country schools are back up and running. Many were used as shelters in the storm. Support is still needed to bring our community back to its original beauty and we hope people will continue to come help and to come visit. I’ve you made it this far, thanks for reading! I know this has been a long post. And thanks for your support! It meant a lot to hear from so many of you. Your concern and love is quite humbling. Thank you all. Much love from the House house. Good to hear all this Jodi. So glad you hung in and came through it all. The new FL Building Codes are really pretty good, though not a protection against rising waters. Great family experience (in retrospect).